Law enforcement plays a critical supporting role in recreational boating safety. 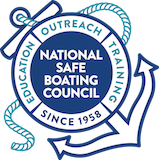 Each interaction between recreational boaters and law enforcement personnel – or between media reporters and law enforcement personnel – offers the possibility for educational outreach to the public. Law enforcement officers or public information officers responding to the media relative to boating accidents should be trained to always answer three questions, whether they are “asked” or not. If you are not an appropriate media contact, please direct the reporter to the correct person in your organization.